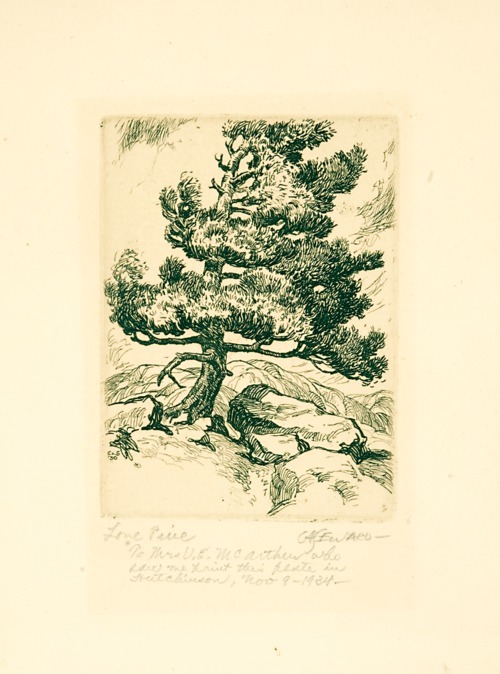 Black and white intaglio print on paper, depicting a single pine tree in a rocky terrain. The artist was Coy Avon Seward (1884-1939), born in Chase, Kansas, and trained at both Washburn and Bethany colleges. Seward was a founding member of the Prairie Print Makers Association. This group believed art should be affordable for all people. Seward inscribed this print to the donor, Virginia McArthur of Hutchinson, who saw Seward produce the print in 1934.